Navigating mental health systems and services in Texas can be daunting, even for advocates and policymakers. The maze of behavioral health services is complex, making it difficult to understand and difficult to improve. 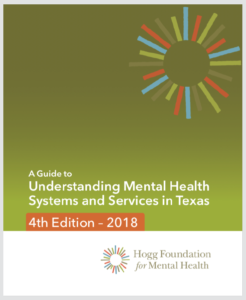 The Hogg Foundation prepares a new edition of the Mental Health Guide to coincide with each Texas legislative session to help inform mental health and substance use policy analysis, development and decision-making. We aim to support advocates, policymakers, consumers and their families as they navigate mental health systems and services in Texas. The intended audience for this guide includes legislators, legislative staff, state agency staff, advocates with lived experience, family advocates, mental health providers and other stakeholders interested in mental health and substance use policy. Download the complete Mental Health Guide, or check out the other tabs to download single sections. Looking for something specific? Once downloaded, use the search function in your PDF viewer, or simply press the “Ctrl” and “F” keys simultaneously on your keyboard. While this guide focuses primarily on state policies and programs, the foundation recognizes the important role of communities. Many communities and local providers throughout the state are engaged in the development, implementation and oversight of locally funded and operated programs and services that are specifically designed to meet the needs of those communities. We encourage communities to engage in local collaborative efforts aimed at addressing the mental health needs of Texans from a population health perspective, and to place particular emphasis on identifying and supporting individuals who have been historically underrepresented in mental health policy discussions, as well as those who experience significant health disparities. Learn how parity works and how to get help if treatment has been denied.